Well folks, it’s hard to believe, but StashMyComics.com turns 10 years old this year. 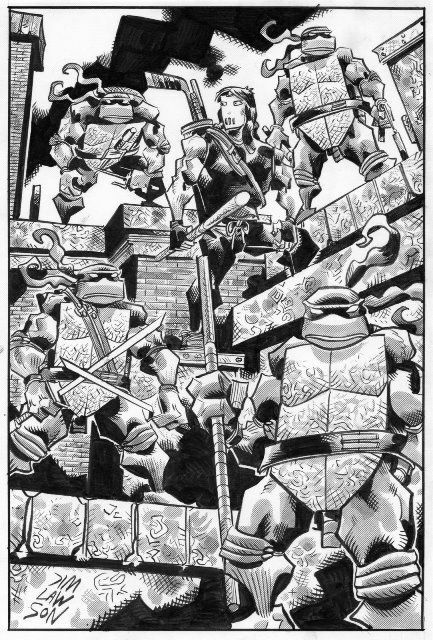 To celebrate, we have a HUGE announcement, something everyone can get a piece of: Custom artwork from TMNT legend JIM LAWSON! 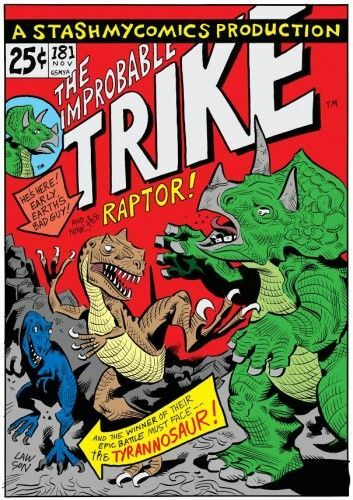 The art features a fresh interpretation of the famous cover from the first appearance of Wolverine in Incredible Hulk #181… using dinosaurs! Who doesn’t like dinosaurs? To make sure everyone gets in on the fun, we’ve supplied several merchandise options to choose from, including shirts, stickers, posters, Ipad sleeves and more. YOU CAN ONLY GET IT HERE! As an added bonus, there are also sticker and shirt options featuring artwork from Kelly Williams (The Cabinet, Metaphase), as well! In tandem with our big announcement, I sat down with the dinosaur drawing wiz for an interview. We talk about his history with the TMNT, what he’s been up to and what he has on the horizon. StashMyComics (SMC): Thanks for joining us Jim! A lot of people know you for your early work on the Teenage Mutant Ninja Turtles. How did you come to work on those characters? Jim Lawson (JL): It was just good luck, really. Pete’s wife, Jeaninne, worked as a teacher at the high school that I went to down in Connecticut. Through a friend of mine (who also was a teacher) a meeting was arranged for me to meet Pete, and his partner Kevin. This probably was back in ’86 or so. Anyhow, I met Peter and Kevin (Steve Lavigne was there too). I brought along my portfolio as if I were going on a job interview and I remember at the time that I was pretty much wowed by these young, goofy guys who were actually making a living at drawing, and doing what they loved. I definitely had my eyes opened to the possibilities that they showed me. SMC: In your career with the TMNT, what thing are you most proud of? Any favorite stories? JL: It’s really tough for me to pluck out something that I’m most proud of. I hate to admit it, but I truly am my own worst enemy. Rather than take an example of something that I’ve done and hold it up as great or good comics, I really am kind of hard-wired to find its faults. I’d love to go back and redo much of the stuff that I’ve done that’s out there. That said, I absolutely love what I do, the actual process of creating comics. It’s so satisfying to me to be able to write and draw- and I wouldn’t trade it for anything. Don’t get me wrong- there are times when I’ll do do a drawing or write something and I’ll just be like, “Wow- I really like that!” or “That’s actually good!” I don’t think that I can give you something where I’m entirely pleased with the whole thing. SMC: I approached you with the idea to do the artwork for the SMC anniversary because of the incredible work you’ve done in your creator owned series Paleo. Can you tell us when your love for dinosaurs began? JL: I had to think far back for this one. I can remember when I was a tiny kid, sitting on my grandfather’s lap, as he read to me from The Golden Book Encyclopedia of Natural History. I think it really transformed me and turned me on to the whole nature thing. Anyhow, one of those volumes I can distinctly remember and it was the dinosaur issue. It just blew me away that at one time these creatures walked the earth and lived their lives. It’s funny- thinking about this question made me feel all nostalgic and I recently went on ebay to order that book. SMC: Speaking of dinosaurs, I understand you recently announced a big project along that theme. Can you tell us about it? JL: Yup. I got a little creative burst this past winter to do a comic that explains and follows the evolution of the dinosaurs. It’s done as basically a walk through a themepark with 2 characters, as they follow a timeline from the earliest signs of life in the seas to the extinction event at the end of the Cretaceous. I’m covering about 540 million years here. In all the dino books that I have- it’s not really presented as a timeline. The different groups are just shown together (theropods, sauropods, etc.) This story follows time. Speaking of that, I tried to do it as a story. Hopefully, it will be entertaining as well as educational. Lastly I’ll just say that it is a comic, and I wanted to keep it very approachable and not bombard the reader with a bunch of scientific names and terms. SMC: Kickstarter was successfully used to fund your graphic novel, Dragonfly. Do you think you’ll use crowd funding again in the future? JL: Absolutely I would. I’m a big fan of Kickstarter and I just love that there’s a venue for creators to make their projects real. I’m a terrible self-promoter, and there is that aspect to Kickstarter that I have to come to grips with, but other than that I think it’s great and would definitely go back and do it again. SMC: You’ve been posting pages of your second volume for Dragonfly on your Facebook page. Any plans for putting it in print? I like Dfly a lot- and my new dinosaur project has one of the characters from it as the tour guide in the themepark (John) so there still is a connection there. I can change my mind at the drop of a hat, but right now I’m very uncertain about Dragonfly. SMC: I think your artwork is one of the most distinguishable (and personally one of my favorite) styles that exist in the industry. How did you develop your talent and what influenced you? JL: How do you answer this question? How does one explain how they draw the way that they draw?? I don’t really know but I will say this- it feels like a journey, a visual journey. The beginning was easy to pinpoint- my old “Bad Biker” days back when I first joined Mirage. Since then it’s been a squishy, organic evolution of art that’s been always changing- at least that’s how I see it. I can’t honestly say that I’ve tried to emulate anyone or to strive for a certain look- my style is just kind of me. There’s been problems along the way. Because I draw the way I do (different, not necessarily in a good way to some) there’s been times that the feedback from the fans has not been good. Some have blamed me for the sagging sales of the Turtle books near the end of the Mirage run. I even heard at one time, Kevin wanted to get rid of me (from the Turtle book), but Pete wouldn’t let him (don’t know if that’s true). I carry this with me- this knowledge that some folks aren’t fans of my work but in the end, I truly believe that it’s you yourself that assigns value to your work and it’s something that you have to do for yourself, first above all. If others see it too- then that’s a bonus but if not then so be it. I don’t worry about it too much anymore. SMC: What are the challenges of having a long career in comic books? JL: I guess becoming bored or losing the spark. I’ve seen firsthand how the desire to draw just leaves you- and although this individual seems to be fine with it, personally I think that in my case it would be devastating. There are struggles- when things come with great difficulty or not at all. You’ve just kind of got to power through them. SMC: How do you enjoy life? What tools do you use to do so? In addition to beer, I’m a big motorcycle guy and I even teach (instruct) motorcycle riding on the weekends. I have a small garage full at home, and when the weather’s nice and I have time- I’m generally out on the bike. I’m a total bike nerd. SMC: Anything else coming up people should know about? JL: The one thing that I did very recently was a 7 page story for the upcoming IDW TMNT 30th Anniversary book (just finished the inks this week actually). It sounds like it’s going to be a great volume with a bunch of treats for the fans from the Turtle’s history. I was honored that they (IDW) asked me to be a part of it. Interested in Jim’s work? 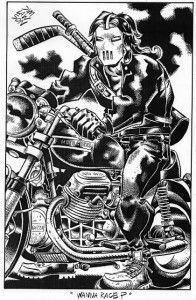 Visit jimlawsonart.com to read the dinosaur comic, Paleo, see some of his TMNT art and even buy some comics! Don’t forget to visit StashMyComics’ Zazzle store to grab his amazing SMC 10 year anniversary artwork! 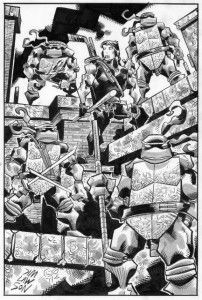 Awesome interview from an icon in the Turtles history, and an awesome artist to boot! I’ll be getting my own shirt here soon! Wow, that’s my friend Jim. He really is famous and so talented. Then after you meet him and hang out he is a regular joe. Fun loving and lots of laughs. Great interview thanks! I agree Bill. One of the most down to Earth guys I’ve had the pleasure of talking to. Thanks for the read!